If you want coupons for dell.com, then GetDiscountCoupon.com is the place for you. Just click on the code to copy dell.com discount code. Then paste it in the coupon box during checkout and click apply. This amount will be automatically deducted from total price. We're always updating new Dell discount coupons. 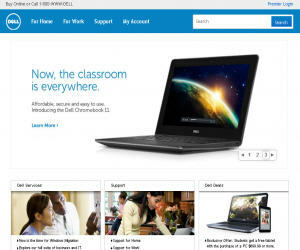 Free Shipping on orders over $49 at Dell! Save 20% on select Dell laptops and desktops. Save 10% on Dell ink bundles! Save 25% on select Dell laptops and desktops. Featured Promotions for Alienware Gaming Computers! $386 off Inspiron 17 7000 Series Touch laptop w/ 4th Gen Intel Core i7, 16GB memory, NVIDIA GeForce 2GB graphics, 17.3-inch HD touch display for $1158.74! Check out the great deals and savings on Computers, Electronics, & Accessories at Dell's coupon corner! Save $525 on the LG 55-inch LED Smart TV - 55LN5700 HDTV 1080p for just $924.99! Free shipping! Save an additional $50 on the LG 42-inch LED Smart TV 42LB6300 HDTV 1080p +1yr Netflix for just $599.99! Free shipping! Limited time only! Save $989.99 on the Sharp 60-inch LED Smart TV 60SQ15U 3D HDTV 1080p with a 2 year warranty for just $1499.99! Free shipping! $20 off the PlayStation 4 System Bundle with InFAMOUS: Second Son Limited Edition and NBA 2K14 for just $499.99! Free shipping! Save $587 on XPS 8700 desktop w/ 4th Gen Intel Core i7, 24GB memory, 2TB hard drive + 256GB solid state drive, & 1GB NVIDIA GeForce for $1349.99! Save $1000 on Sony 55-inch LED Internet TV - XBR-55X900A Bravia 4K 3D UHDTV w/ 4 pairs of 3D Glasses for $2999.99! Get additional $400 off when you use Dell Preferred Account! Free shipping! FREE shipping on all TV purchases at Dell! $330 off the XPS 12 2-in-1 Ultrabook laptop with the 4th Gen Intel Core i7 processor, 8GB memory, 256GB solid state hard drive, 12.5-inch HD touch display for just $1319.99! Super Sale! Save $100 on the Inspiron Small Desktop 3000 Series with the Intel Pentium Dual Core processor, 4GB memory, and 500GB hard drive for just $299.99! Free shipping! Get a $25 promotional eGift card + $10 off when you purchase the Kinect Sports: Rivals - Xbox One for just $49.99! Free shipping! eGift card shown in cart. Save $260 on the LG 55-inch LED TV 55LN5200 HDTV 1080p for just $639.99! Free shipping! Get $20 off + get a $50 promotional eGift card when you purchase the Sony Creative Software Download - Sony Sound Forge Audio Studio 10 for just $39.95! Free shipping! eGift card shown in cart. Get $50 off + a $125 promotional eGift card when you purchase the LG 32-inch LED TV - 32LN530B Edge HDTV for just $279.99! Free shipping! eGift card shown in cart. Super Sale! Save $150 on Inspiron 15 7000 Series laptop w/ 4th Gen Intel Core i5, 6GB memory, 500GB hard drive, and Windows 8.1 for just $699.99! Free shipping! $140 off the Xbox One System Bundle w/ Titanfall, Tomb Raider: The Definitive Edition, and Extra Controller for just $599.99! Free shipping! Save $170 on the Inspiron 17 laptop w/ Intel Core i3 processor, 4GB memory, 500GB hard drive, and Windows 7 Professional for just $399.99! Free shipping! Super Sale! Save 20% on the blue Swiss Gear COBALT Computer Backpack for 15.6-inch notebooks for just $39.99! Free shipping! Get $202 off + a $400 promotional eGift card when you purchase the Samsung 55 Inch LED Smart TV UN55H6350 HDTV 1080p for just $1197.99! Free shipping! eGift card shown in cart. Dell Home Electronics & Accessories. Feel the power. Save up to 24% on impressive PCs! Quantities are limited at these prices. Free shipping! Save $551 on the Inspiron One 20 with the Intel Core i3 processor, 4GB memory, 1TB hard drive, and Windows 8 for just $499.99! Free shipping! The New XPS 8700 Desktops. Save 50% off the Dell 8X External USB Optical DVD+/-RW Drive for just $39.99! Dell Home & Home Office. Save $590 on the LG 55-inch LED Smart TV - 55GA6400 1080p 3D Google HDTV with Magic Remote Qwerty Plus Voice Search and 4 Pairs of 3D Glasses for just $1109.99! Free shipping! $10 off the PlayStation 4 500GB Console w/ NBA 2K14 for $449.99! Free shipping! Purchase through Dell Advantage loyalty program & Dell Preferred Account financing to get 10% back in rewards! $100 off Inspiron 15 7000 Series laptop w/ 4th Gen Intel Core i7, 16GB memory, 1TB hard drive, & NVIDIA GeForce 2GB graphics for just $1049.99! Free shipping! Save an additional $75 on the LG 55-inch LED Smart TV 55LB6300 HDTV 1080p + Yr of Netflix for just $1024.99! Free shipping! $540 off Inspiron 17R laptop with the 4th Gen Intel Core i7 processor, 16GB memory, 1TB hard drive, and Windows 8.1 for just $799.99! Free shipping! $440 off the Inspiron 17R laptop with the 4th Gen Intel Core i7, 8GB memory, 1TB hard drive, and Win 8 for just $649.99! Free shipping! $250 off the Inspiron 15 7000 Series with the 4th Gen Intel Core i5 processor, 6GB memory, and 750GB hard drive, and Windows 8 for just $599.99! Free shipping! Get 10% back in rewards and free 2nd business day shipping with any purchase when you use the Dell Advantage loyalty program and our Dell Preferred Account! Super Sale! Save $170 on the Dell 23 Touch Monitor - S2340T 1080p for just $479.99! Free shipping! Save $1824.99 on Sony 65-inch LED Internet TV - XBR-65X850A Bravia 4K 3D UHDTV w/ 4 Pairs of 3D Glasses for $3299.99! Get additional $700 off when you use your Dell Preferred Account! Free shipping! Upgrade to PC gaming with Alienware's trade-in program! Trade in your used game console or PC and receive a $200 promotional eGift card with the purchase of a new Alienware system. Free shipping! Never miss coupons from Dell! Enter your email below and we will send you the latest and greatest Dell deals. For more than 28 years, Dell has empowered countries, communities, customers and people everywhere to use technology to realize their dreams. Customers trust us to deliver technology solutions that help them do and achieve more, whether they're at home, work, school or anywhere in their world. Learn more about our story, purpose and people behind our customer-centric approach. You will enjoy Dell's wide array of desktops, laptops, monitors, printers, TVs, cell phones, and other popular consumer electronics and accessories. Dell's Alienware products are known as a powerful force in the gaming industry. Offering high-performance desktops, notebooks, media center and professional workstations. Customers are at the core of everything we do. We listen carefully to their needs and desires, and collaborate to find new ways to make technology work harder for them. In all we do, we're focused on delivering solutions to enable smarter decisions and more effective outcomes so our customers can overcome obstacles, achieve their ideas and pursue their dreams. Above all, we are committed to the superior long-term value they need to grow and thrive. Once you have find the available Dell.com promo code, choose the best Dell.com code according to your needs because you can have multiple promo codes for Dell.com. You should check any restrictions and policies before applying coupon, such as expiration date, because some coupons are valid for very short period, So if you need a Latest Dell.com Promo Coupon / promotion code please BOOKMARK US (Ctrl + D) and check this site frequently. And one important thing some coupon codes are case-sensitive.